Locally-elected council members from across the country have backed the campaign by the NEU’s Councillors Network, which is supported by education fair funding campaign group f40, in expressing concern about the desperate state of school funding in England and Wales. They are urging Government to invest more money in schools in the Spending Review this year to help meet the huge funding crisis across education, which is resulting in growing budget deficits, cuts in teaching staff, a reduction in some subject areas, and a poorer education for children. The Institute for Fiscal Studies states that schools have suffered a cut of 8 per cent per pupil since 2010. The Education Policy Institutehas said almost a third of all council-run secondary schools are now in deficit and, according to last year’s Kreston UK report, eight in ten academies are in deficit. The NEU believes the situation cannot go on and there needs to be a reversal of cuts to school budgets since 2010, and for the funding of schools and Special Educational Needs and Disabilities (SEND) provision to be of a level that ensures all children and young people get the education they deserve, regardless of where they live. Campaign group f40, which started more than 20 years ago with the aim of influencing significant change in the way government allocated funding to local authorities and schools, threw its weight behind the NEU’s letter to Damian Hinds. “This letter represents the next step in trying to lobby the government to urgently stop the hugely damaging cuts to school funding. “The cuts to school budgets have reached epidemic levels in England and Wales. Increasingly, tighter funds mean schools across the country are narrowing their curriculum and cutting subjects like drama and art, which is a travesty. “Schools are also struggling to provide adequate support for students with Special Educational Needs and some are even closing early or starting late to save money. Teachers’ workloads have become unsustainable as they are asked to do more and more with less, including larger class sizes and fuller timetables with less support. 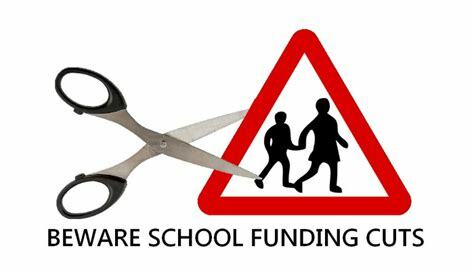 As councillors, we are writing to express our grave concerns over the Government’s ongoing cuts to school funding. Our excellent state-funded schools have lost out in billions of pounds in funding since 2015. The Institute for Fiscal Studies has equated this to an 8 per cent real cut per pupil in real terms, since 2010. The funding crisis has become so overwhelming that according to the Education Policy Institute, almost a third of all council-run secondary schools are now in deficit, and eight in ten academies are in deficit according to last year’s Kreston UK report. Many schools are now desperately overwhelmed, as more and more students are competing for fewer and fewer resources. Compounded by biting cuts to local council services, in addition to the teacher recruitment and retention crisis, the current settlement is not tenable. • Reversing the cuts to school funding since 2010. • Giving our schools the funding they need. • Funding Special Educational Needs and Disabilities (SEND) provision properly. Our children only have one chance to go through the school system. By cutting funding to schools, the Government is failing them. It must change course urgently, and give our schools, education professionals and students the proper funding they need.